From 1912-1930, only men occupied the role of the interior cabin steward aboard aircraft. The first steward was a German, Heinrich Kubis who's first flight was in 1912. In 1930, the first female flight attendant was hired by United Airlines, a registered nurse named Ellen Church. By the late 30s, flight attendants were not required to be nurses and had replaced nearly all men in the position. In the early days, there were a host of requirements including odd ones such as flight attendants could not be married women, and those that chose to be married lost their jobs. Since the early days, requirements have modernized considerably, and both men and women take to the skies in this fun, often rewarding position. 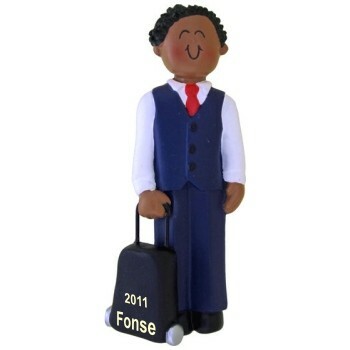 To honor them, we offer our flight attendant Christmas ornaments for both genders, for blonds and for brunettes, for Caucasian and African Americans. 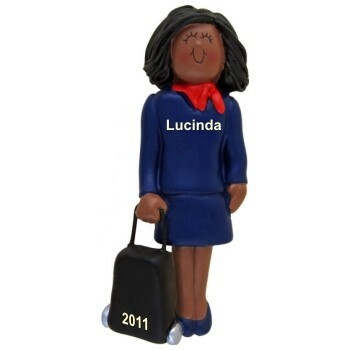 Personalize the ornament for stewardess close to your heart as a congratulations on graduation from flight training. 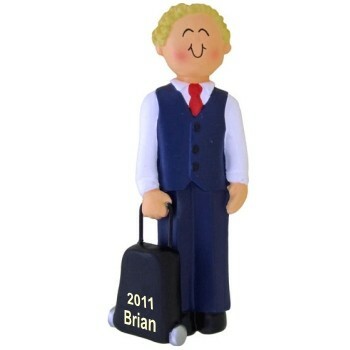 Or, personalize the ornament for steward as a tribute and thank-you gift for years of excellent service. Each of our flight attendant ornaments arrives nestled in our exclusive black velvet bag, ready to make a thoughtful present to someone special.